Happy Memorial Day! Hope you’re enjoying the long weekend and planning something fun. 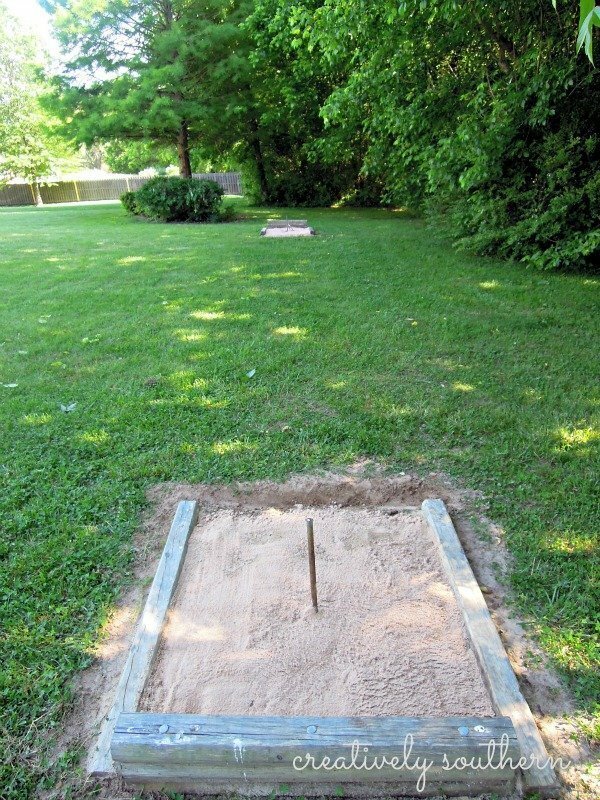 I’ve been working on a few things around the house, and one of those is re-working the horseshoe pits in the backyard. 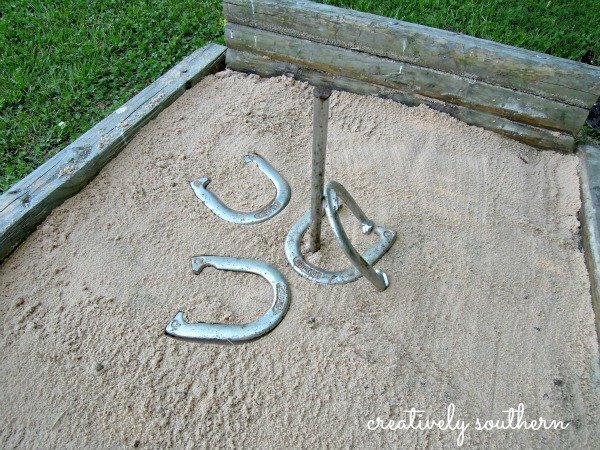 While these horseshoe pits were built in my pre-blogging days 😉 I can still show you how to build some of your own. Plus you get to see how well they have held up after two years! 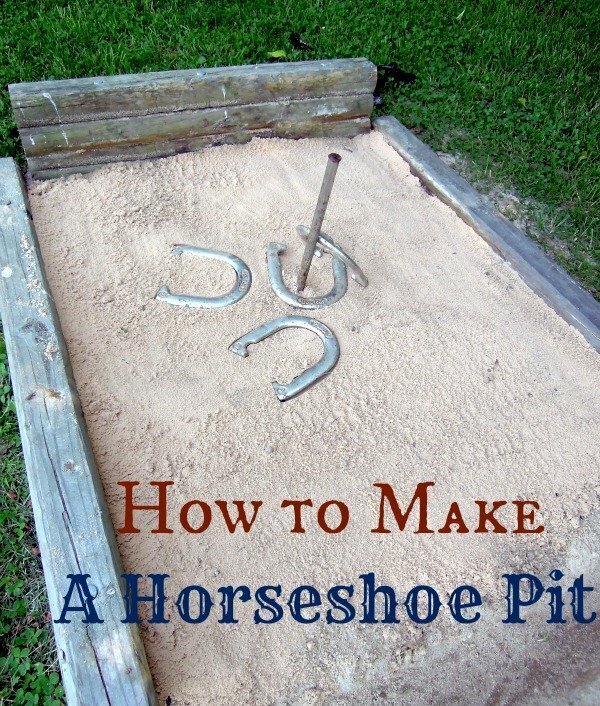 Building your own horseshoe pit is easier than you may think. I used landscaping timbers and landscape timber stakes to build the frame. First, you need to decide on a location and have plenty of space. We built two pits and put the stakes 40′ apart, according to regulation. You can certainly put them closer together, especially if you’re building these for children or whatever distance you feel comfortable with. That’s the good things about it being in YOUR backyard… YOUR rules. 🙂 Just be sure you have plenty of clearance around the pits in case you get a few stray horseshoes thrown. For the backer board, I used 4 landscaping timbers, each cut at 3′ long. For the sides, I used 4 landscaping timbers (2 on each side), cut at 48″ each. The front of the pit will remain open. Step 3: Do some ground work. I laid my frame on the ground where I wanted the pit to be. Mark it off on the ground with some spray paint, and start digging. You want to dig down some so that the pit is a bit below the ground level. This will help stabilize the frame and keep the sand in better. 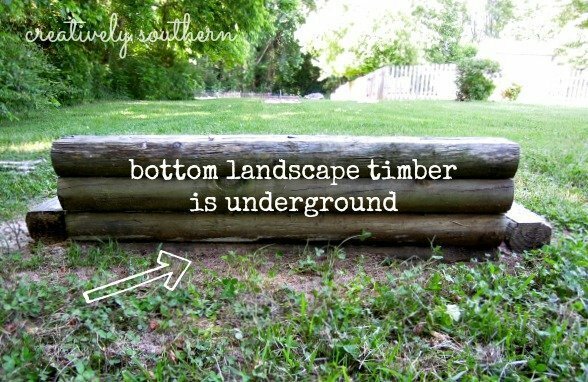 You can see in my pictures below that the bottom landscape timber is actually underground on all three sides. Be sure to dig all the grass out so no weeds creep in on your pit later. You may even consider using a landscape fabric, but in my case I just dug it out reeeeeally well. Once it’s all dug out, place your frame in the ground. Make sure it’s level by adding or taking away dirt as needed. Back fill around the frame until it’s firmly placed and stable in the ground. If you’re ground is really soft, you might consider mixing up a little concrete mix to help stabilize. You can pick up a set of horseshoes and the stake at any sporting goods store. The stake should be placed 36″ from the front of each frame. Using a hammer, plant the stake in the ground leaving 18″ of the stake above ground. The stake should lean forward to the front of the pit about 2 – 3 inches. 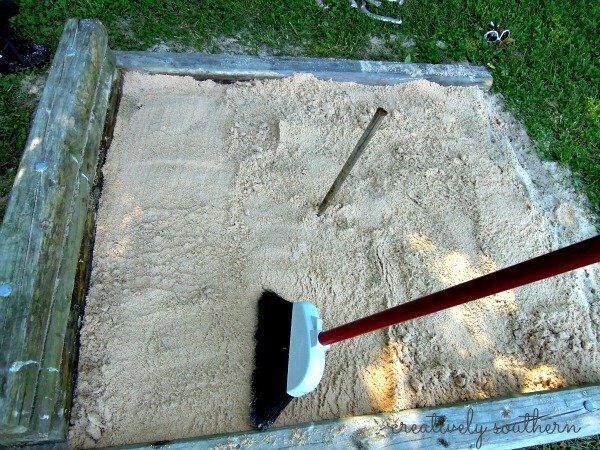 It’s time to fill your horseshoe pit with sand. 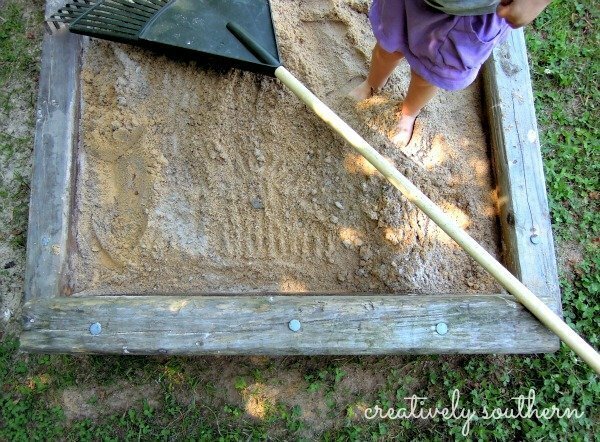 I use the play sand from The Home Depot and for the initial set up, you want to build a base of sand that is 4″ deep. That will leave your stake sticking up 14″ above ground which is regulation standard. I use a rake and a broom to smooth out the sand surface. Step 6: Learn to play. Once you have all your sand added and smoothed out, you’re ready to play! Since we have two pits, I created a mirror version of what you see here at the opposite side of the yard. There’s lots of ways to get points. Ringers should be called first. A ringer is a horseshoe that completely encircles the stake. If there are no ringers, then the horseshoes that land closest to the stake can earn points. Games are played to 21 points, and your team must win by 2 points. Step 7: Unlimited backyard fun for all! There you have it! 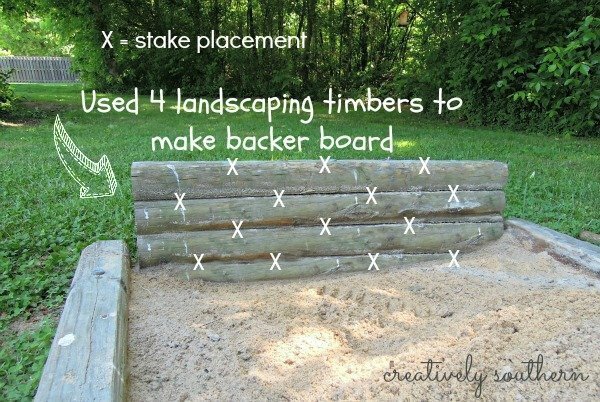 Some simple how-tos for making your own horseshoe pit. Like I said before, these horseshoe pits have been in place for two years already and they have held up great. I’ve had to do a little maintenance every year… replacing a bag or two of sand, re-setting the stake, and cleaning out a few weeds and grass. But overall, they are quite easy to upkeep! Do you or have you ever played horseshoes? I’m certainly not very good at it, but it’s still a fun activity for everyone of all ages! Hope you have a great holiday and thanks for stopping by! Yes, I have two timbers on each side and I attached them all together with the landscaping timber stakes by just driving them through the timbers. Hope this helps! Thanks for the help we are tired of the stake comeing out of the ground. He really was looking how to have a pit put being able to take it apart I think the wife wins on this and it stays all year around in the back yard. I need the work out. You have been featured at The DIY Dreamer!!! Come on over and grab your featured button, you deserve it! I can’t wait to see what you share this evening at From Dream To Reality #70! Thank you so much Christine!! I can’t wait for the next party. Have a great week!! TOTALLY LOVE IT!!!! Can you make one for me??? So cool!! 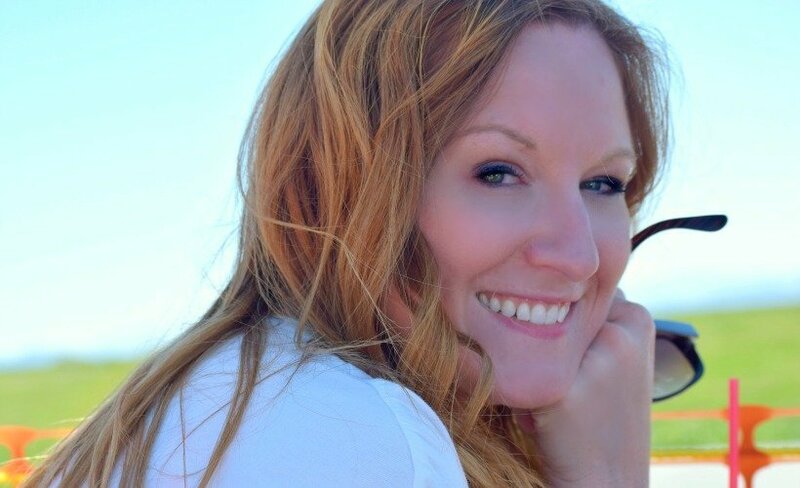 Thanks so much for sharing this at The DIY Dreamer… From Dream To Reality last week! Looking forward to partying with you again tomorrow evening! Thank you Christine! I’ll be glad to make one for ya, and then we can enjoy a few games and backyard fun! 🙂 Thanks for hosting the party! Thanks Shannon! Yes, it’s definitely a great summertime activity to share with friends and family! Thanks for hosting the link up contest. Lots of great projects!! A leaner is not worth 2 points. It’s only worth 1 point. That rule was changed a long time ago. Please make that correction in your rule explanation. Thanks for catching that error for me Jerry.I didn’t even realize that had changed. We just played the same way we always have. I have updated the post. I appreciate it! How fun…I love playing horseshoe. We played all the time when I was a kid and my family went camping. I wish our backyard was big enough for a horseshoe set-up.